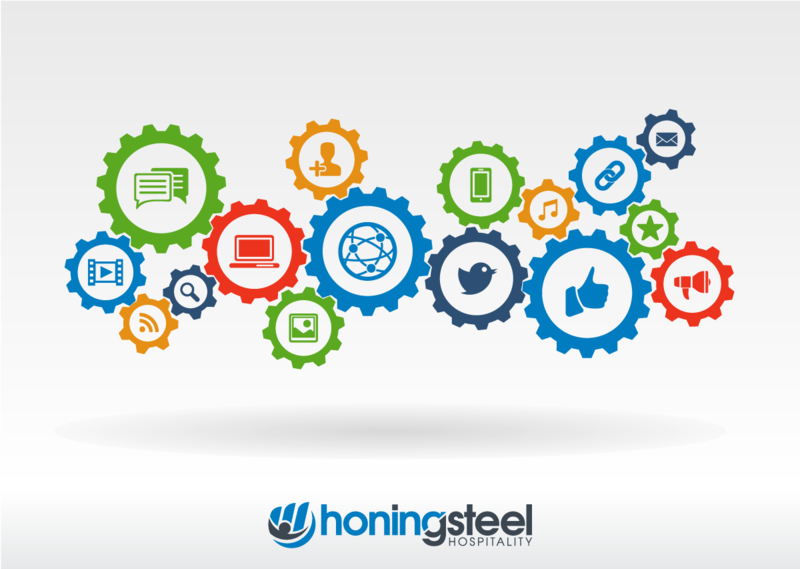 A consulting company helping restaurants, bars, hotels, retailers & other hospitality-focused businesses with their digital marketing, reputation management, and hospitality standards and operations. Instagram has entered the territory of “must” rather than “nice-to-have” when it comes to social marketing for businesses. There are a few key reasons why every business should have an Instagram account, and why you’re going to be pretty left out if you don’t get on this social platform. The data shows that Instagram is the #1 platform for getting post engagement. That means that if you want to establish a relationship with your client base (which you do), then you’re going to need that post engagement that only Instagram can provide. It’s an interesting time to be involved in social media marketing… Facebook is facing major allegations, and as a result—people are doing crazy things like starting movements to delete their Facebook accounts… (For my sake, and the sake of your distant relatives, please do not delete your facebook). As much as internet trolls might have you think that it’s the social media Armageddon, I assure you that life will go on. It might be looking a little overcast in the internet landscape, but before we pack our bags —there’s still some hope. Facebook’s more charismatic and adopted little brother (Instagram) still has users entranced with its purity and boasts a pristine opportunity for brands who are ready to stir up the marketing pot. Now, Instagram is the #1 platform for post engagement because its focus on visual content creates a very unique space for brands to interact with others—and if you’re a skeptic, the numbers don’t lie. According to a study conducted by Forrester, Facebook and Twitter organic post engagement levels are currently less than 0.1%. In comparison, the millennial-centric Instagram boasts regular engagement at 4% for brands. (That’s 40x better, by the way). 80 percent of Instagram accounts already follow a business on Instagram, and 65% of top-performing posts feature products. 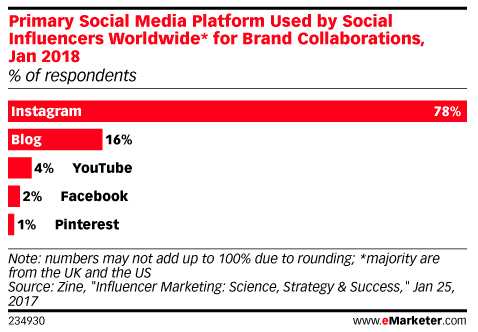 The translation here is obvious, Instagrammers want to see branded content, and they want to connect with brands. Add the engagement levels for brands (4%) that we just saw and we have the optimal landscape for growing your branded following on this platform. Instagram is a tool for lead generation. We know that social media strongly influences purchase decisions, even if that is at the subconscious level of the consumer decision-making process. It’s 2018, and our favorite lead generation tool (Facebook) is making algorithm changes that are making it harder for brands to get heard. With engagement rates already resting around the 0.1% mark, it just might be the ideal time to expand your reach to include some Instagram marketing. With Instagram, 60% of users have first heard of a product or service through the platform, and over 120 million Instagram users visited a website, got directions, or called/emailed/direct messaged a business as a result of their engagement with the platform (sproutsocial). That means that 120 million Instagrammers have been lead to a business through the platform. You can easily use Instagram to generate new business and sales with strategic content and links in your bio, as well as reach new targeted and engaged audiences through paid ad campaigns through the Facebook ad platform. A little-known fact is that when an Instagram user posts something on Instagram and uses a location tag, this tag isn’t owned or regulated by the business that owns the physical location. 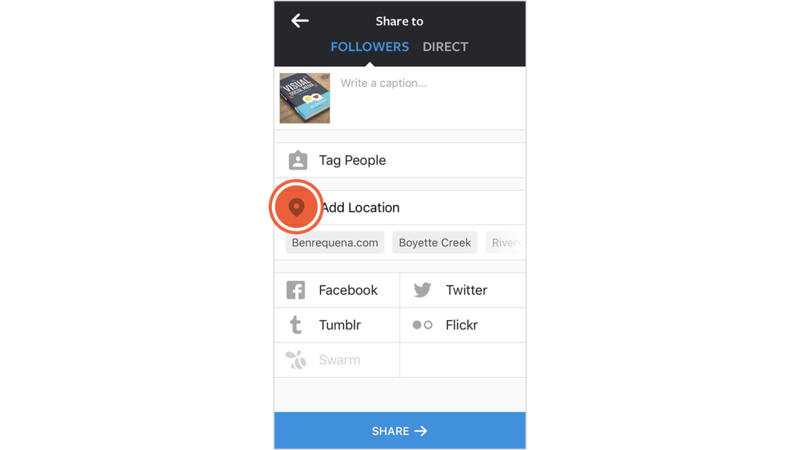 All location tags on Instagram, or “Instagram Geotags”,” are tied to a separate public account that Instagram will store posts under. For businesses, this is a blessing and a curse. Say you own a local restaurant and you have numerous dedicated and consistent customers who love to post at your restaurant and have nothing but glowing words to accompany beautiful pictures of your space. When others look at your location on Instagram, this is what they see, and they are that much more likely to convert and become loyal customers as well. You own the same local restaurant, but one dissatisfied customer took it upon themselves to post a picture of your front door exclaiming their disgust with the service that they received. This post has lingered on the web and likely dissuaded other customers from posting to the location, and has resulted in the loss of unknown amounts of revenue through prospects who steered away from your business as a result. Although you have no control over the things that users might be saying about your brand (much like standard reviews), you can still help mitigate some possible damages by having a branded Instagram account and monitoring the posts on your location. Much like negative reviews left on other review platforms, by responding to negative Instagram posts, you are much more likely to prevent harm to your reputation. As of 2017, nearly 71% of businesses in the United States were already using Instagram. The release of Instagram business profiles and the ability to to run ads/analytics with ease have been large factors in driving the Instagram growth movement. You may notice that this looks like an exponential growth graph, and that’s probably because it is. Fortunately for you, just because 71% of these businesses are using Instagram doesn’t mean that these businesses are using it to its full potential. We can make a pretty good estimate as to where this usage rate is going to reside by the end of 2018, so don’t get left behind. Don’t wait, get started on your Instagram strategy today to generate new leads, amplify your brand, and build new business! The importance of responding to customers online could not be more prevalent as reviews continue to grow more than ever before. Aside from the fact reviews from customers help others decide whether they should visit a business or not, reviews are now more prevalent on search results pages — meaning a lot of eyes can see what is being said about your company online. 1) Business reviews and social posts help shape your company’s online reputation. In fact, one of the worst things your business can do is ignore your online reviews and social posts. As easy as it is to make a mistake when handling your business’s online reputation, it can also be easy to recover if done properly (and with apology). While damage will inevitably happen, your business can take steps to mitigate the degree of damage that can occur. The biggest mistake of all your company can make is not participating in helping to shape the conversation about your company online. 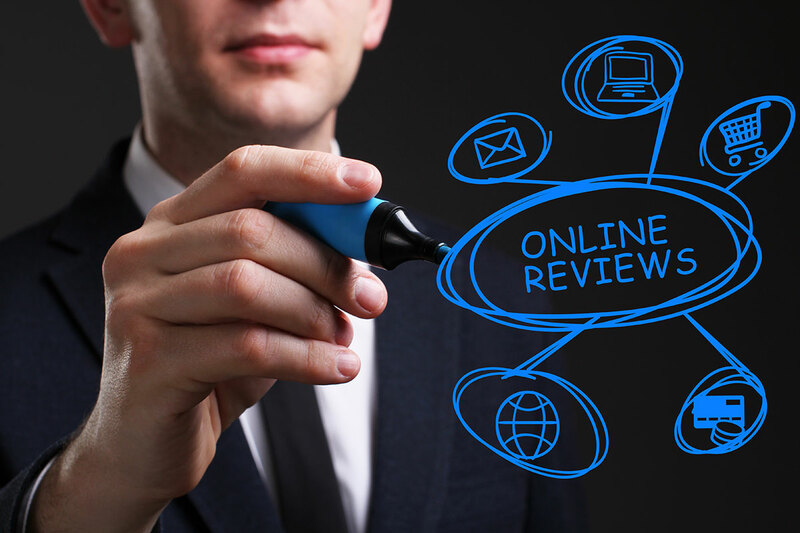 2) Business reviews provide valuable feedback for your business. 3) Your business reviews can now appear in search results. Search engines have caught on to the popularity of reviews and are now displaying them more prominently. So, if someone searches for your business, there is a chance that reviews from review websites could be displayed on the search engine results pages. In Google’s markup—the annotated content that appears in search—of a company or product, business reviews and ratings can now be included in search results. In other words, when a user performs a search on Google, Google will find and possibly display review summaries from online business reviews and consumer ratings. 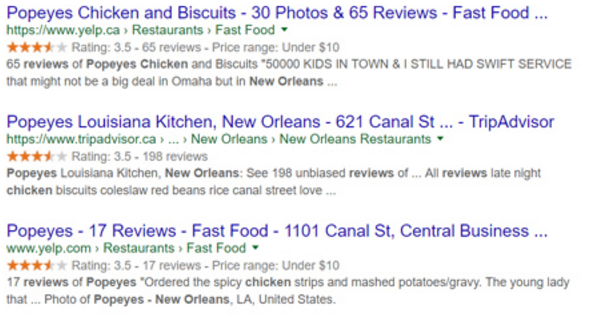 Below is an example of how business reviews now showing up in search results. 1) Remember to add or claim listings on the top review sites. It’s a good idea to add or claim a listing or business profile on the most popular review sites (unless your business doesn’t fit with the niche), correct your business’s listing information and start getting more business reviews! 2) Your business should keep asking customers for reviews. 3) Customers are more open to leaving reviews on review sites. Why not just ask for business reviews or testimonials on your business’s website? Well, asking consumers to leave a review on your business’s website seems a lot more screened and inauthentic than simply asking consumers to leave reviews on a trusted review site. Since the review site is a third party, it feels more open for customers to leave an honest, unbiased review. Business reviews are here to stay. In conclusion, there’s no getting away from business reviews. The good news is that there are methods to get more business reviews as well as effectively managing reviews from customers. Also, businesses needn’t fear negative online reviews, as there are ways to negate the effect of negative reviews. While the world of online marketing has expanded far beyond paid advertising, advertising still plays a very important role in generating revenue and business. Digital advertising is the top of the “new advertising stack,” and it’s what can create brand awareness, drive sales, and create visibility across a variety of channels that are oversaturated with businesses trying to stand out. Although there are many new players in the online marketing landscape like email, social media, and reputation, digital advertising isn’t set to slow down yet—a statement that’s underlined by the fact that ad spend is set to grow from $83 billion in 2017 to over $129 billion by 2021 (DMB Adobe). We’ve compiled this list of top advertising stats so you can spend your advertising dollars where it matters, and get the ROI you need to thrive in the digital world. 1. Digital advertising spending is set to grow from $83 billion this year to $129+ billion by 2021. 2. Google and Facebook are set to rake in 63.1% of digital advertising spending in 2017. 3. Google has +20% year-over-year advertising revenue growth, Facebook has +62% year-over-year growth. 4. 39% of marketers list search engine marketing as their top business priority for 2017. 5. Marketers that invest over 10% of their budgets on measurement are three times more likely to beat their sales targets by 25% or more. 6. 56% of advertising use engagement to measure success, 21% use conversion & revenue. 7. 34% of social media marketers list “tying social campaigns to business goals” as a top challenge. 8. 2017’s video advertising spend is $13.23 billion, and projected to reach $22.18 billion by 2021. 9. 68% of consumers respond positively to watching video ads for mobile app rewards. 10. 52% of marketers believe that video is effective for brand awareness. 11. Online shoppers who view demo videos are 1.81x more likely to purchase than non-viewers. 12. 51.9 percent of marketing professionals worldwide name video as the type of content with the best ROI. 13. According to retailers, video can account for a 40% increase in purchases. 14. Mobile shoppers are 3x as likely to watch a video than desktop shoppers. 15. 46% of users act after viewing an ad. 16. 80% of consumers remember a video ad they viewed in the past 30 days. 17. Combining video with full-page ads boosts engagement by 22 percent. 18. E-commerce sellers find that using product videos increases product purchases by 144%. 19. Video ad completion rate for videos 15 seconds long is 93-95%, with 30 second videos seeing a completion rate of 92-93%. 20. Over half of video advertising is viewed on mobile. 21. Americans spend 71% of their online time on mobile, with Canada and the UK coming in at 62% and 61% respectively. 22. Average smartphone conversion rates are up by 64%. 23. Mobile advertising accounts for $37 billion of the $73 billion total ad spend (51%). 24. 81% of consumers feel negatively about mobile add pop-ups. 25. Mobile accounts for 60% of click share on Google Search ads, compared to desktop’s 32%. 26. Search ad spending on mobile is set to rise by 25% in 2017. 27. 70% of advertisers plan to increase their mobile social advertising budget in 2017. 28. 26% of Facebook Users that click ads make a purchase. 29. Images account for 75-90% of Facebook advertising effectivity/performance. 30. The best headline length for a Facebook ad is four words, with 15 for the description. Contact us to get started with digital advertising for your business today! Want to visit our new office and see our wonderful view of Monument Circle, while learning more about what a partnership with Honing Steel Hospitality can do your business? Contact us today! Level Office offers fully furnished, amenity-rich workspaces with direct fiber internet & WiFi in prime locations so businesses can thrive. With budget-friendly private offices, office suites, dedicated desks, coworking memberships, virtual offices and daily offices, Level Office is perfect for small businesses, entrepreneurs, professionals and companies expanding into a new city or looking for an impressive new office space. When clients rent an office space at Level Office, they’re not only getting a physical workspace—fully furnished with desk and chair, direct fiber internet and WiFi, and company logo display—but access to tons of on-site amenities and entrepreneurial community! Our communal lounge areas and coworking space are available to all Level Office members and feature a fully-stocked kitchen, espresso bar, and local beer on tap, as well as an array of great networking events. Plus, our all-inclusive pricing means that mail service, 24/7 secured access, and taxes and utilities are already included in clients’ rent. As the fastest-growing owner-operator of shared workspace nationwide, Level Office takes pride in renovating and improving historic buildings with the latest technologies and amenities, all while keeping rents 30-50% lower than other coworking providers. Our clients love the vibrant community within Level Office, and we encourage clients to do business with one another through networking events, Lunch & Learns, and happy hours. Completed in 1930, Circle Tower overlooks downtown Indianapolis’ prestigious Monument Circle and is listed on the National Register of Historic Places. A prime example of Art Deco architecture, this unique building features a ziggurat crown, Art Deco sculptures, and bronze grilles with hieroglyphic images. Overlooking the Soldiers and Sailors Monument on Monument Circle, the historic Circle Tower boasts one of the city’s most prestigious addresses. Restaurants, hotels, nightlife, and nearby parking abound, making it the perfect location for networking lunches or meetings with clients. In addition, the building’s proximity to Washington Street, I-65, I-70, and multiple local bus lines makes it easy for commuters to get in and out of the city. Circle Tower was designed by the firm of Rubush & Hunter, and built to house prime office space, with commercial storefronts on the ground floor. Faced in smooth-dressed Indiana limestone, the building rises to stepped back top stories, ziggurat-like upper stories that recede from the outer façades in terraces, punctuated by Art Deco sculptures. Each pier top is ornamented with capital blocks carved as stylized foliate panels. The north entrance has a massive one and one-half story arch lined with foliate banding. The ziggurat crown, sculpture façade panels, granite sculptures of the arched entryway, and the design of the interior lobby, elevators, and street-floor shops are highly illustrative of the Art Deco style. Circle Tower was completed only eight years after archeologist Howard Carter’s sensational discovery of King Tutankhamen’s tomb in 1922. The intricate bronze screen over the north entry arch reflects the widespread interest in Egyptology at the time. Sculptor Joseph Willenborg filled the bronze grille with hieroglyphic-like images, stylized into the Deco mode. For some industries, this can be bad news, as traditional media can take a backseat to modern technology. Luckily for the restaurant industry, people will always be hungry, and they will always be looking for new dining experiences to satisfy both their hunger for food and taste for adventure. Yet, with Instagram, Facebook and Snapchat overrun by pictures of delicious meals all around the world, it can be hard for a local restaurant owner to find ways to stand out in the digital crowd. That’s where digital advertising technology and tactics comes in. This is the story of how one restaurant turned hungry internet surfers into happy new customers with the power of digital advertising, and the team who skyrocketed their ROI to 4,381%. Recently, Matthew Kennedy, President of Honing Steel Hospitality, appeared on the Abdul At Large program on WIBC 93.1FM radio, along Dave Meeker of Bringing Tech 2 You and Mike Murphy of Hirons Communications. On the program, we discussed the pitfalls businesses should avoid when it comes to social media with Abdul-Hakim Shabazz of Indy Politics. Sites like Yelp, Google Reviews and Zomato are dominating the digital landscape and telling your potential customers where to go. Make sure your raving fans are sharing their love for your restaurant online. Place a survey card on each table. Don’t pass the card out with the check; put the survey card in a card holder where it is visible and easy to see. Ask your server team to refer to the survey card and encourage patrons to fill it out. Keep the survey brief (no more than five questions) with check-the-box options to make it easy and convenient. Give them a contact info section where they can enter a drawing for a prize, such as a gift card for a free appetizer, free dessert, etc. Once you’ve captured the contact information of your raving fans, create a follow-up email campaign that asks them to review your restaurant on other sites. Provide links to the sites in the email to make it easy for them and offer rewards for bringing in a copy of their online review the next time they dine. Not a fan of the card method? No problem. Retailers have been using online surveys and contests in exchange for contact information with great success. For example, while large companies like Home Depot have their own survey sites, you can use survey tools like SurveyMonkey, or an experienced digital hospitality consultant can assist you with a custom survey feature on your website. While many people use third-party sites to read reviews, if your restaurant has a landing page dedicated to reviews that appear in the search results, it will get traffic. Looking for a creative tip? Personalize the page with patron photos and images. Invite your mom to star in her personal photo shoot and review! Be sure to use the caption “Sincerely, Mom,” or use the parent of a chef, hostess or lead server. If you already have a reputation management strategy in place to deal with negative reviews, it will be easy to implement a policy toward the positive reviews. Whenever someone gives your restaurant a five-star rating, make a comment and ask them to review your restaurant on another site as well. Be sure to thank them, include a link to your restaurant page on the review site, and offer to give them a photo shoot for your reviews page the next time they visit. Getting positive online reviews for your restaurant isn’t difficult; it just takes a little effort backed strategy and creativity. As people are increasingly spending more time with their eyes glued to screens, it’s vital to have a social media strategy in place. With so many different platforms out there, it’s imperative to know how to use them all and be able to cater to each one’s nuances. Here are three reasons why you shouldn’t underestimate the use of social media for your business marketing strategy. In the United States alone, over half of all small businesses increased their social media marketing budgets this year. People all around the world are now more glued to their personal screens than ever before, with Facebook statistics today showing there are more than 1.2 billion users. People are often more willing to buy from a brand that they feel a connection with. Nowadays, this means a digital connection — when they are subscribed to your social media channels, you can personally interact with them and meet their needs. Besides the many free platforms out there, you can get your most loyal customers to advertise for you, at no cost at all. When they are genuinely interested or convinced that your product is the best, they are likely to share it among their own social network. And your reputation grows. And so your marketing efforts can be more targeted and efficient while costing you much less in the long run. However, in order for your social media marketing plan to be effective, you must be willing to put in the time, research and initial investment. Don’t be afraid to spend a lot of time in the beginning learning how various platforms work, updating your tools and apps, and getting to know the world of digital marketing. Then later, once your business is up and running, you will have an easier time managing your digital networks and seeing results. Today, more than ever, social media is more important and essential for businesses. But the key is planning a strategy that works for you and your market. Need help with formulating your next social media strategy? For more advice, tips and digital consultation, call us today. As one of the longest-running forms of social networking, Twitter’s perfunctory style (only 140 characters per tweet) means it’s challenging to gain a following. Some restaurants avoid Twitter altogether because of the frustration of tweeting to an empty forest. That’s why those ads for fake followers can be so tempting. But should you really do it? The practice of paying for followers on Twitter isn’t new. In the 2012 presidential election, Mitt Romney attracted unwanted attention with a dramatic increase in followers in a single day. Fake followers are easy to get, inexpensive and can boost your confidence. Celebrities and brand names do it all the time. But, ethics aside, are fake fans a good idea? Here are both sides of the argument. With a few dollars, you can buy a few thousand followers and feel good about how your restaurant looks to others. If your competition has many followers, you can match that number or exceed it. There might be other reasons to buy followers; for example, you need to take a screenshot of your page for promotional reasons, or your restaurant will be in the limelight due to a news story. Having a stock of followers on Twitter lends legitimacy when others are looking. Also consider the law of attraction — if your account appears lively and interesting enough that many people follow it, others will want to participate. There’s nothing wrong with buying a few followers to get real ones. One good reason not to buy followers is that others probably don’t care that much about your follower count. Spend some time on Twitter, and you’ll soon realize what matters is the quality of your tweets and ability to capitalize on hashtags. Do those two things, and you’ll acquire followers naturally. Another reason to avoid fake fans is that the companies providing them control their accounts. You could wind up with throngs of followers whose profiles promote causes you don’t believe in or are antithetical to your business. 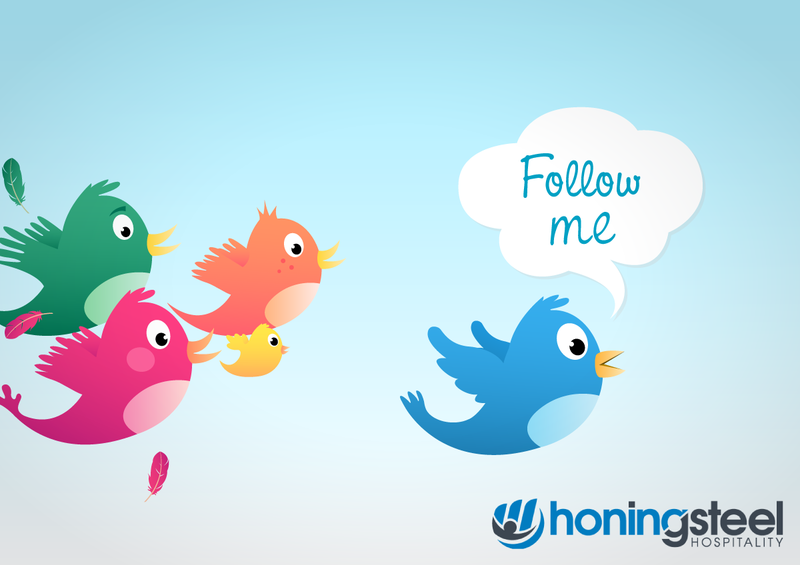 There are other quick ways to get followers besides buying them. Hold a contest on your Facebook page or Instagram account and make a requirement that entrants follow you on Twitter. An even more solid route: Host an Amazon giveaway. Choose a book or other product on Amazon that reflects your cultural ethos. When you designate it as a giveaway, Amazon will ask for your Twitter handle and let you require the participants to follow you. Since thousands of people enter Amazon giveaways, you’ll soon be hearing the pleasant ping that means a new follower has landed in your nest. Once upon a time, building your business meant registering with the Yellow Pages and hoping people would find you. These days, the tidal wave of social media has left businesses awash with opportunities to connect with new and existing consumers around the clock. In fact, 95 percent of millennials expect brands to have a presence on Facebook and 80 percent expect them to be on Twitter. Simply put: If you want to grow your business, you need to get social. Here are five ways to use your social media pages as a business tool to create new customers and ultimately drive real income. Facebook ads let you specifically target your ideal customers and encourage them to like your page. You can narrow the field by region, age, other pages they already like, and other relevant details. Combined with a social media icon on your website, soon you can start attracting qualified leads on social media. 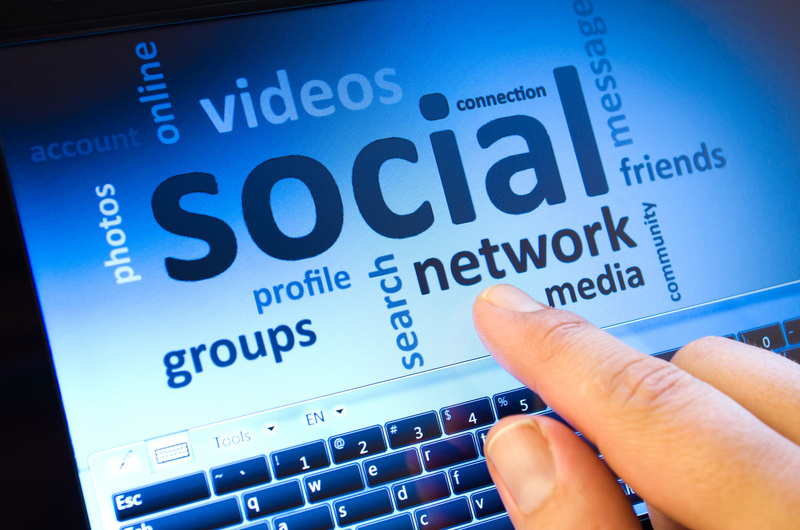 Once you have people interested in your social media pages, you’ll need to stay engaged. Your social media management strategy should include more listening than talking. Take polls, respond to questions and comments, and get to know your base. As a small business, positive and personable engagement on social media can really set you apart from your competitors. Start sharing valuable resources. Industry papers, new articles or your own thoughtful blog content all make meaningful posts. As you become known as a go-to source for interesting content and timely information, your business’ reputation will grow and improve. Your social media pages can also be a venue for building trust with the public. Be routine and prompt with your responses to followers, and post content on a regular basis. Is there an industry crisis or problem you can help with? Offer advice and service right away. Your responsiveness on social media will send the message that you treat customers with quick and friendly service every time. A robust “About” section that includes a link to your website helps convert people from online followers to real life customers. You never want to spam people with constant links back to your site, but a healthy dose of blog content leading there can drive traffic. Your social media pages are not a “set and forget” operation. When it comes to social media management, you’ll need to monitor them as much as possible to cultivate meaningful relationships. Once you do, your social pages can be an excellent source for leads and real money!